Let’s face it. You can’t ditz around with advanced obedience training and expect to get titles in an expedient manner. Let’s face it. You can’t ditz around with advanced obedience training and expect to get titles in an expedient manner. Picture me hitting myself with a rolled up newspaper. It is one thing to take thirty tries to get a UD title if you have a hard to train dog (of any breed). But when you have an uber-achiever for a canine student there aren’t any excuses. I’m getting squeaky close to being ready for the Utility obedience ring. My six year old Border Collie, Levi, is showing a lot of promise. He is also showing me he can be really, really stubborn. Therefore I must, MUST train every day. Watching other people excel with their dogs encourages me to push myself to be a better trainer. 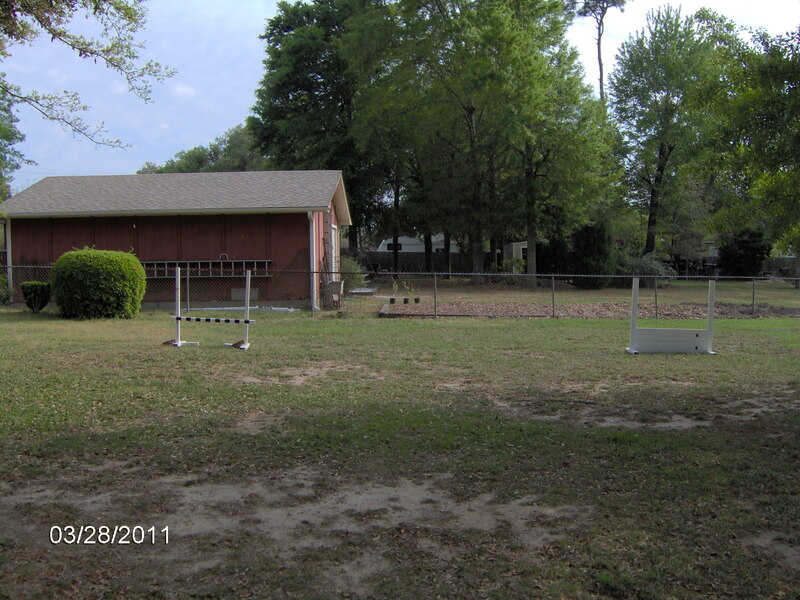 As an extra incentive I can’t stand being embarrassed in the obedience ring, especially after paying a $25+ entry fee. I’m a Taurus though, stubborn and hard headed. I vowed this weekend that this little forty-nine pound dog is not going to win the battle of wills. Recently we came home from some disastrous Utility training. Rather than put the dog in the kennel and call it a day, I continued the training inside the garage. I’m the first to admit that a lot of Levi’s problems start and end with me but we just have never really “meshed” like I did with River. We are getting better as a team. The problem starts when we go into a mock ring and he ignores me totally, becoming fixated on the task at hand. I get SO frustrated with him, which makes me nervous since people are watching our crash and burn performance. He doesn’t trust me when I’m upset and he seems to say to himself, “Oh, crap. What did I do now? I’d better do something, anything to please this witch”. He never shuts down because the work I ask of him makes him happy. The problem is Levi has his own agenda and sitting patiently at my side in precise heel position is not on his work sheet. In the garage after this particular training session we had a super time. What am I to do with myself and my nerves? Other than yell, “FIRE!” before I go into the competition ring to clear out any spectators, what is the solution? Hmm. Levi is doing great with his Open exercises so the clue may be we need to be super, super confident with our performance so when we get into a tense environment muscle memory comes into play-for the both of us. With that in mind I set out this morning to be careful to train diligently and stay calm. The first decision was to set up an official ring in the field in the back yard. Eh. What size is a standard Utility ring? I went back inside the house to get my AKC rule book. The book says a Utility ring is 40×50, or no less than 35×50. Lucky me. The neighbor’s fence is set up in 10’ increments. It was a surprise that 40×50′ is actually huge. Then I marked off where the jumps should be, which is 18 to 20’ apart. After I walked the ring later in the afternoon I realized the jumps were not placed in the center or halfway point in the ring. So they should be about 25’ from the back and front of the ring. Levi loves his directed jumping as a result of treats or a toy used as a reward during earlier training. Now he can even take the jump signal without a command and my smile tells him he is such a good boy. The problem in the ring is that he wants to decide which jump to take and the heck with me if I take too long to make the decision. Many thanks to my trainer for pointing out early on the handler errors I’ve made giving signals to Levi, directing him to either the bar or high jump. On a side note: how do you as an exhibitor remain clam when you are down to the last go out and directed jump in the Utility A ring? You can bet the farm I’ll have tears running down my cheek-after every leg. Another decision was needed after the long session with go outs. He tends to curve to the left on go backs but does a lovely “look” and fast “go back”. I took the bar off the jump and set it up to the left of the go out spot. Levi thought that meant curve to the left of the bar, making him end up even further off the go out spot. What could I do? Hmm. I went into the garage for some water for him and looked in the Rubbermaid chest of drawers for ideas. I came across a yellow tennis ball. Placing it on the go out spot and putting Levi 10’ away helped him realize that the bar was a guide to help him run straight back to the ball. He was so happy!! Finally I took the ball away and had him run a full length go back, giving him the ball as a reward when he ran straight and sat. We worked on articles but he didn’t seem to see them in the dead grass and leaves, although he was using his nose. I put them away. My thought was lets not even go there for now. For a break I worked my old dog, River. He and I are a team and training him is so much fun. But, alas, he is eleven years old and retired. So we did low jump directed jumping and signals and called it a day. He’s in it for the treats and I love the interaction. Returning to Levi we went inside the cool garage to play. He is going to learn some tricks. That’ll be fun for us and will help our relationship. We worked on: Go over and “touch” the red flagstone, “shake”, “can you (drawn out for excitement): sit? Down? Twist? Stand?” Then he is released for a treat or toy. He loves this game and it is teaching him to wait for my command or I accuse him of cheating. I have a blue and white bar that I held vertically and had him circle, walk through my legs, jump up and touch the horizontal bar and jump up with his front feet on my back and walk behind me. He loved the interaction and always being right. A few hours later we worked on articles and it became more of a game to him. I even sang a circus song to him while setting up the articles just to be funny. We had a blast! Dogs love to see us being goofy, don’t you think? 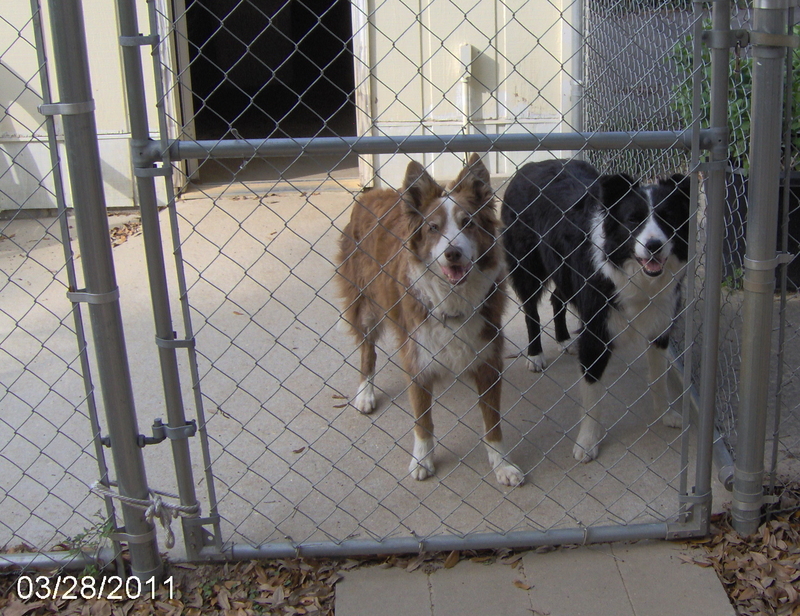 This entry was posted in border collies, Dog training, Retirement Life and tagged Border Collie, Dog training, dogs, Obedience training, Utility Training. Bookmark the permalink.